U.S. Sen. Ted Cruz (R-Texas) said it would be "unfortunate to politicize" the mass shooting in Sutherland Springs. Cruz spoke out after the deadliest mass shooting in Texas history and praised the citizen that engaged the shooter in gunfire. 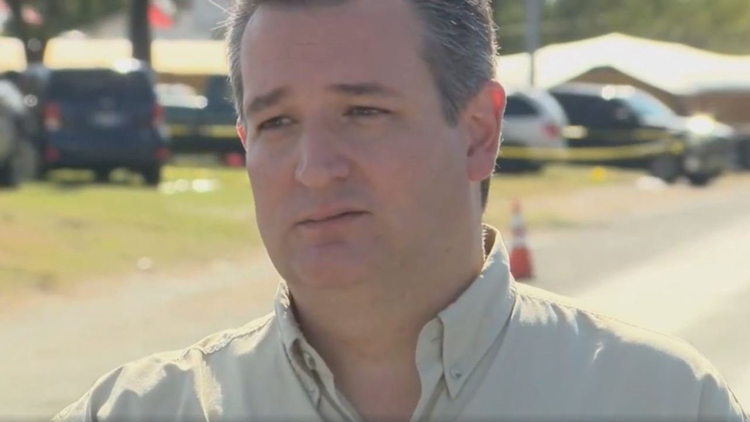 SUTHERLAND SPRINGS, Texas - U.S. Sen. Ted Cruz (R-Texas) spoke to the media Monday afternoon in the wake of the mass shooting at First Baptist Church of Sutherland Springs. "We've seen this evil before. There is a peculiar evil that can worship God and pray with people and then come back and murder those very same people," Cruz said. Authorities said the shooter was 26-year-old Devin Kelley, who was later found dead as a result of a self-inflicted gunshot wound. The incident left 26 people dead and 20 injured. When members of the media questioned Cruz about gun control, he said it would be "unfortunate" to politicize the mass shooting. "We don't need politics right now," Cruz said. "In New York, we saw a terror attack with a truck. Evil is evil and will use the weaponry that is available." Cruz referenced Psalm 23, and said its message applies to this tragedy: "Though I walk through the valley of the shadow of death, I will fear no evil." He also praised the citizen who engaged the shooter in gunfire. "I support right of individuals to defend themselves," Cruz said.